Lately I’ve come across a few articles of interest that I’ve been meaning to mention but haven’t with all the time spent on getting this new site up and running. 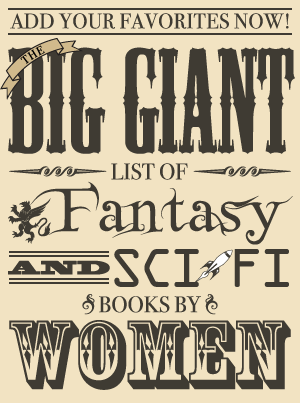 The first of these are a couple of book clubs for next year that each have a wonderful selection of books: The Women of Fantasy and The Women of Science Fiction. I haven’t read all of these but some books I really loved are in this list – The Hundred Thousand Kingdoms (review), Elfland (which I just finished last night), and All the Windwracked Stars (review). Out of these I’ve read one other book on the list, The Gaslight Dogs (review). While it wasn’t a book I loved, it was set in an interesting world and has the potential to be the start to an interesting series. Prospero Lost, War for the Oaks, The Dark Mirror, Indigo Springs and Tooth and Claw are all books I really want to read so I’m going to read at least one (hopefully more) for this. My science fiction reading seems to be lacking since I’ve only read one of these – Cordelia’s Honor, which is a GREAT book (review). Dust and City of Pearl are both on my to-read pile, and I should definitely use this as an excuse to read Dust since I love Elizabeth Bear and can’t believe I haven’t read it yet. The Dispossessed, Lilith’s Brood, China Mountain Zhang and Farthing are all on my wish list so maybe I should use it as an excuse to read one or two of those as well. This piece of news made me squeal a little: there are plans to make Storm Constantine’s Wraeththu into a TV mini-series or movie. The Wraethththu Chronicles is one of my favorite series ever. It would be interesting to see as a movie or mini-series, at least if it was done well. « Welcome to the New Fantasy Cafe!